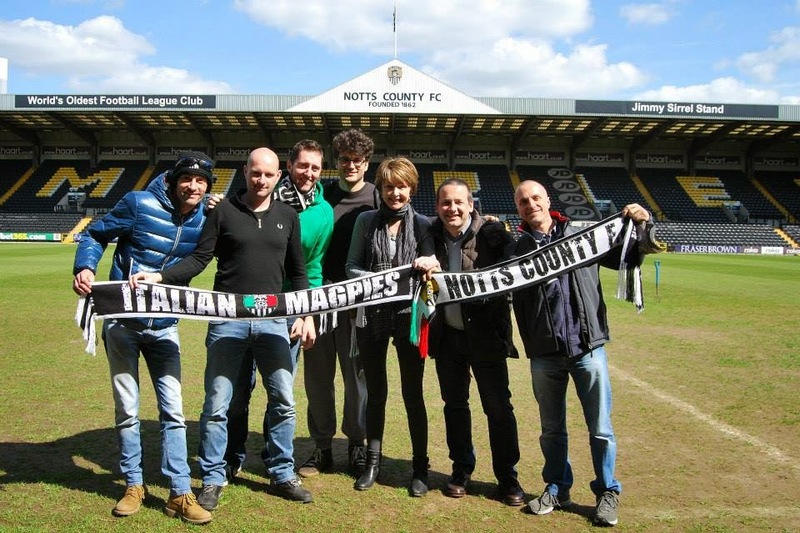 We then all returned to the mini bus to travel to Meadow Lane to meet Aileen Trew a director at Notts County and the wife of the President Ray Trew, for a Stadium tour. Aileen gave them a warm welcome in the main reception as did other members of staff from behind the counter. The tour started,they were shown a time line of photos of different players and managers in the corridor which led to the Players changing rooms. They were taken into the home changing room and then led down the tunnel and onto the pitch. Here they met Dane Vincent from the media team and commercial director Damian Irvine, they had official pictures taken on the home bench and on the pitch. Damian and Giorgio spoke about the Italian Magpies and about Juve's season so far. The tour continued upstairs in the Derek Pavis stand, they were shown Wheelers suite all made ready for match day with Black and White table cloths and the venue for Giorgios interview with Colin Slater from BBC radio Nottingham. Aileen then took them to see a display of all the original shirts of the founder members of the football league that are hung on a wall outside the boardroom. We all then were shown the inside of the boardroom and onto the balcony that looks over the pitch. The Italian magpies took more pictures and were allowed to walk over to and up into the Kop where they broke out into a song. We said our goodbys in the main reception,we went to the ticket office to buy the match tickets and then made our way to the club shop. 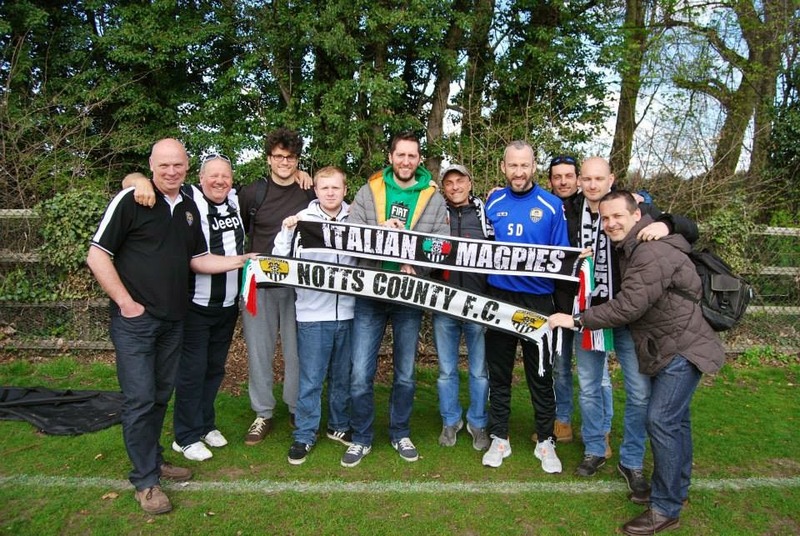 They had their Notts shirts printed and bought souvenirs for themselves and friends back in Italy. After lunch in a local pub called the Trent navigation Josh and I took them back to their hotel so they could check in and freshen up. I met them shortly after and took them to my house for to meet my wife Lisa who had prepared a three course meal including a traditional Sunday roast. like in Wheelers earlier the table was made out in Black and White. We arranged with friends to meet up in town for a few drinks and it was nice to see friends of friends welcoming them to Nottingham. As time passed on it was clear to see that they were tired and ready for bed, they had been up since 3.00am. 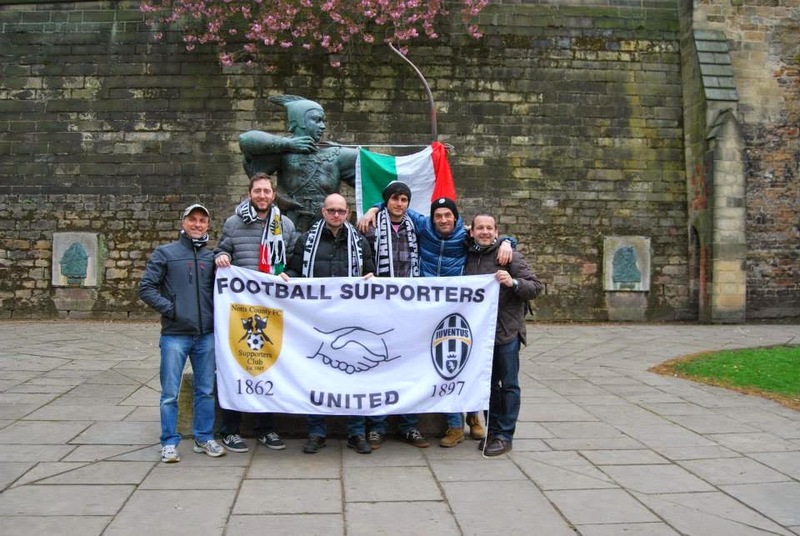 The following day Chris Buckley his son Jake and I met the six Italians at the hotel, we all went Nottingham Castle and the Robin Hood Statue and met up with Paul and Lindy Street, Pete Pacey and his son Sam, for what is now an annual group photo. We went to the Trip to Jerusalem Pub, the oldest pub in Nottingham, to meet Josh for a pre match drink and then onto Meadow Lane. Along the way Notts and Juve songs were song as the excitement was growing for the game. 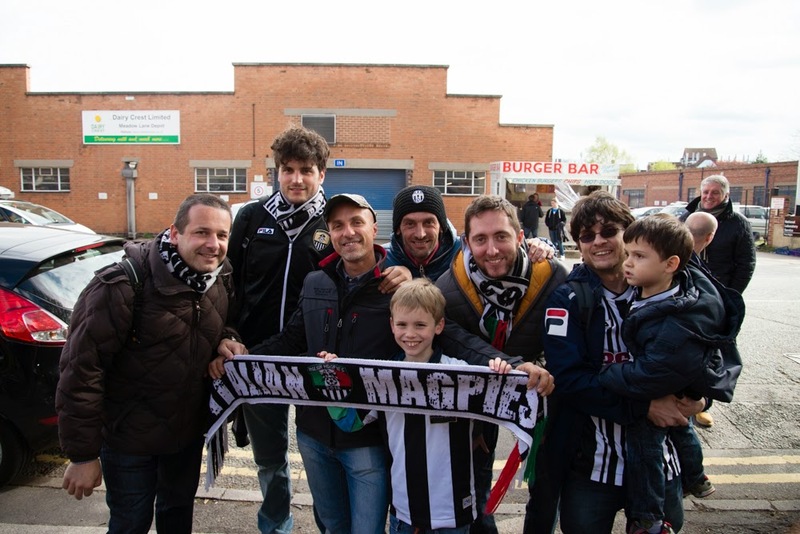 It was another fantastic meeting between the Italian Magpies and the fans of Notts County for the game against Port Vale which Notts won 4 - 2, a great victory from being 0 - 2 down. 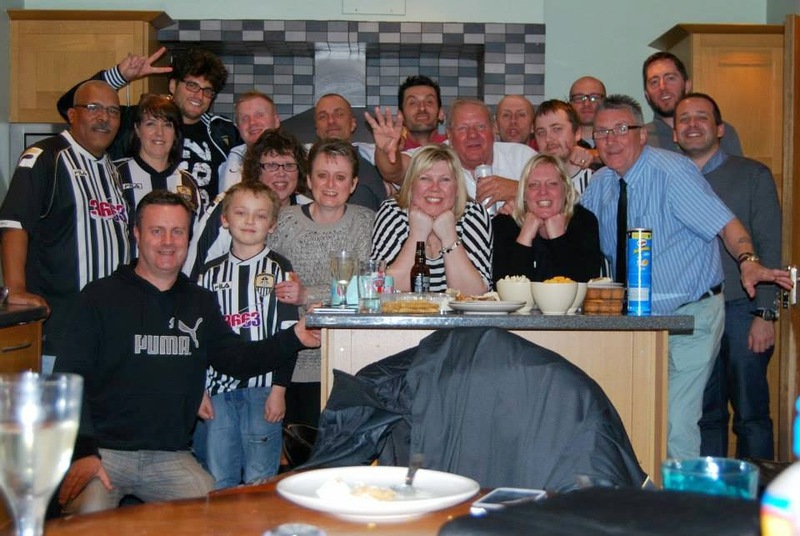 This was the ninth meeting of Notts County and Juve supporters in either Nottingham or Turin to see our two great teams in Black and White since the friendly game on 8th September 2011. We have met so many times now that we are like family, indeed we have visited family homes in Nottingham and around Italy. It seems now that the game of football that we come to watch has become a small part of the trips because our friendship has grown so strong. 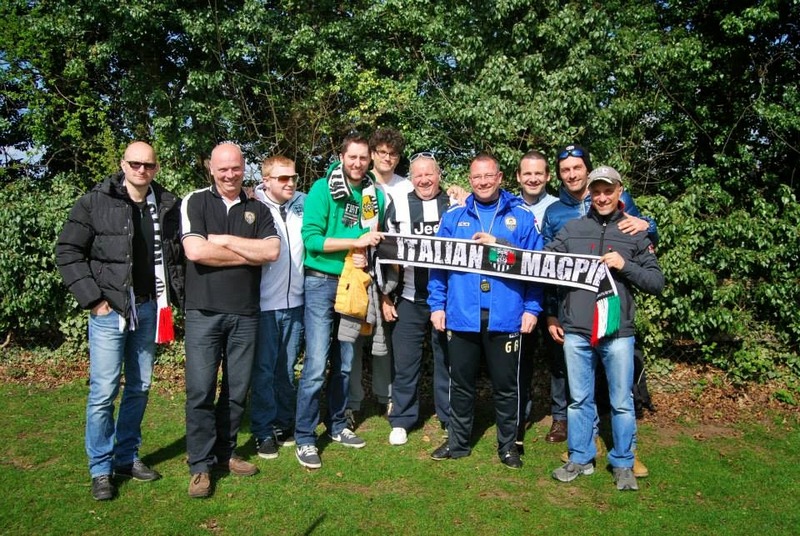 At the match many Notts fans come up to the Italian Magpies to thank them for coming to see Notts County. 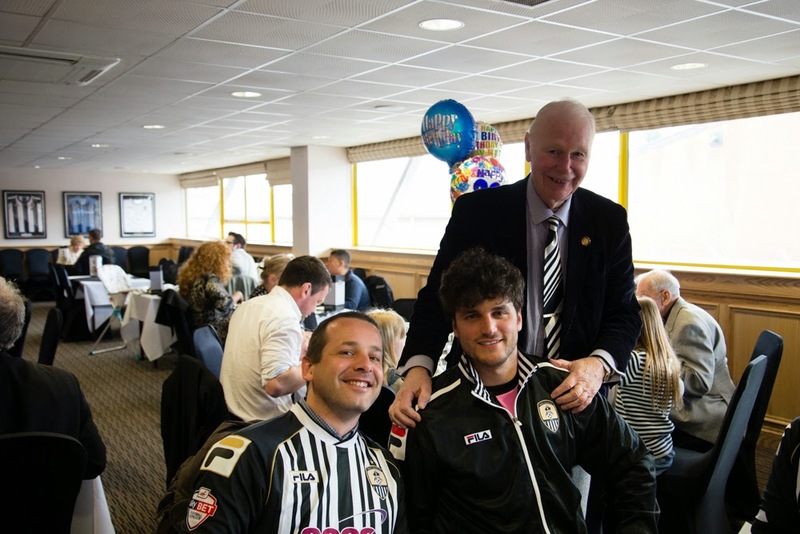 At 2.00pm I took Giorgio and Roberto to Wheelers suite because Giorgio was invited as Colin Slaters (BBC Radio Nottingham) guest and was interviewed in front of a live audience about how the Italian Magpies formed and about the bond between the fans of Juventus and Notts. 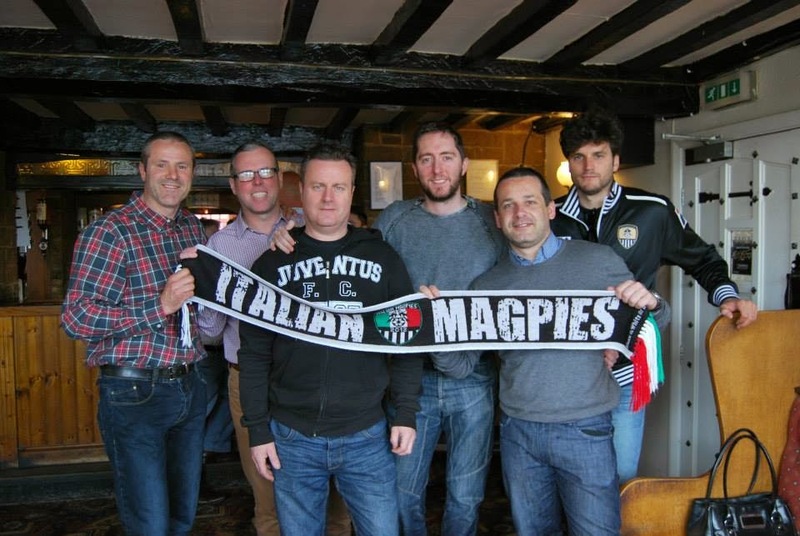 After the interview we returned to The Meadow Lane Sports bar and our Italian Magpie group had been joined by Paolo Abba and his two sons Romeo and Marco. 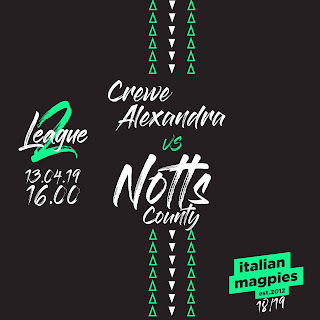 We all walked round to the Kop to our seats and again they were made welcome .When the Italian Magpies stood in front of the stand the Notts County fans gave them a round of applause to show their appreciation. 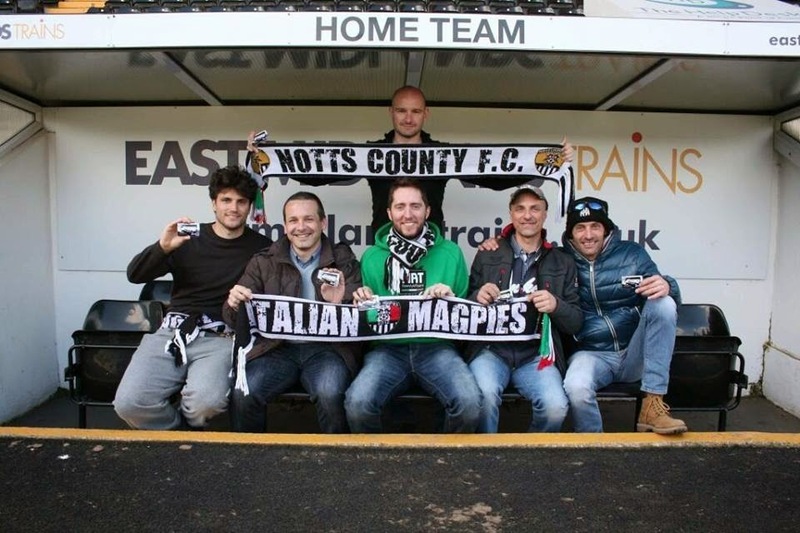 Each time Notts County scored a goal the Italian Magpies celebrated with as much passion as the Notts County fans. When the Magpies went 4 - 2 up the Kop sang " it's just like watching Juve " and the Italian Magpies waved their scarves and an Italian flag was held up to show their appreciation for the song. 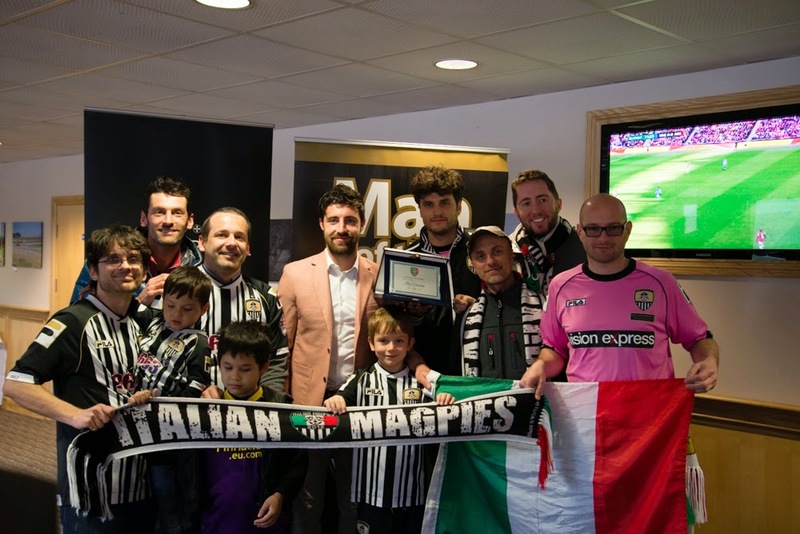 After the game the Italian Magpies returned to Wheelers suite to present the award "Italian Magpie player of the year" to Alan Sheehan. They had a individual photos and a group one too. After the presentation the Italian Magpies and I returned to the hotel to collect Stefano's, Gabriele's and Daniele's luggage as they had a taxi booked from my house back to the airport. 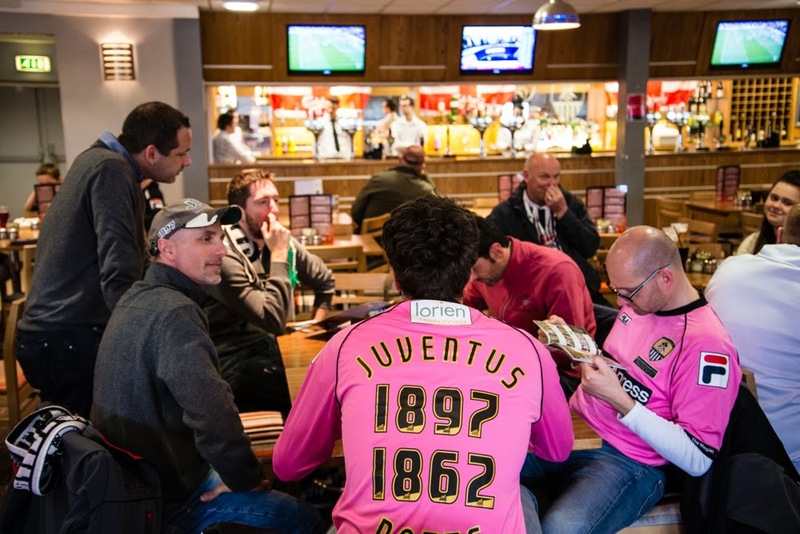 Waiting at my home were many Notts County friends who they had met over previous visits to Nottingham and Turin where conversations continued about the game over a few drinks into the early hours of the morning. 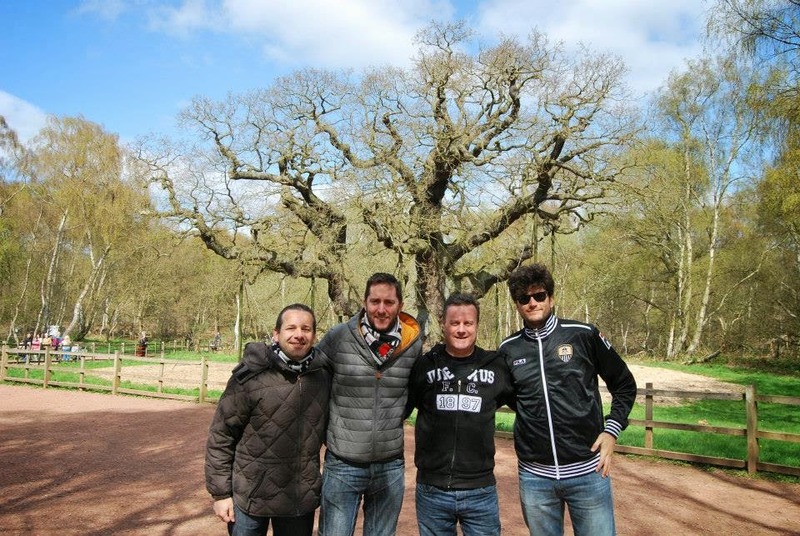 The next day Lisa and I took Giorgio, Roberto and Davide to Sherwood Forest and to see the famous Major Oak tree, where legend has it Robin Hood lived and we enjoyed a picnic in the sun. After we traveled to a village called, Burton Joyce to have a drink in the Cross Keys Pub the local pub of the late legendary Notts County manager, Jimmy Sirrel. The three of them had their picture taken on Jimmy's bench outside the pub paid for by his friends in his memory. Inside we were met by former Notts County player and Colin Slater's colleague on BBC radio Nottingham, Dean Yates for a drink and we talked again about the Italian Magpies. Later we visited Wollaton Park which was recently made famous as "Wayne Manor" in the Batman movie, Giorgio, Roberto and Davide enjoyed the grounds and taking photos of the landscape and the red deer. Sunday evening Lisa, Josh and I took them around some more pubs around an area by the Nottingham canal for a meal and drinks. By Monday morning it was with heavy hearts that we picked them from the hotel to take them back to the airport. We said our farewells with promises that we will meet again next season. 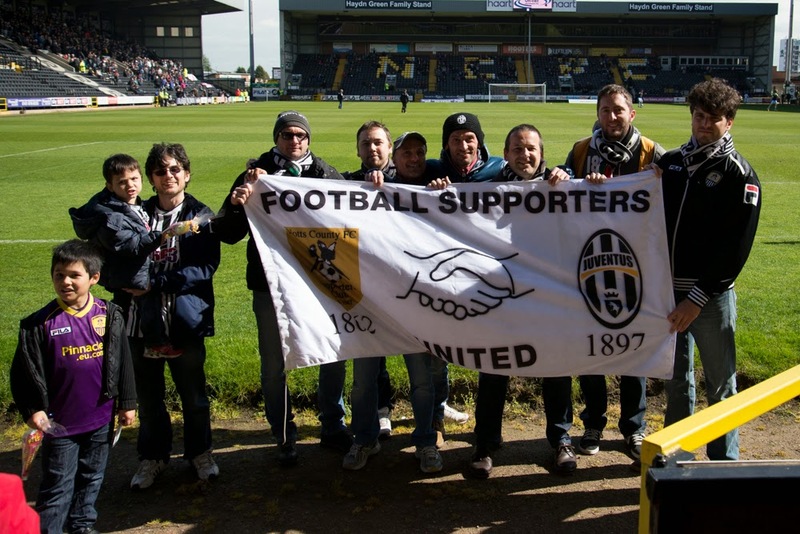 Forza Notts and Fino alla fine forza Juventus!